L-shaped pillow’s unique shape comforts side sleepers in 3 ways: hug it to keep your neck and shoulders properly aligned, use side pillow behind shoulders to support your spine and neck, or use as a leg support pillow for knees, hips and back. 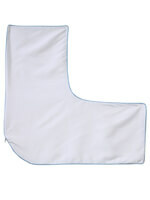 Ergonomic pillow is 48"L x 10"W x 7"H. 100% polyester. Spot clean. I've had trouble with my neck for a long time and have tried many, many pillows. My previous pillow made it hard for me to get comfortable at night. It doesn't take nearly as long with this one. It feels a bit too thick but I'm sure after a while it will settle down. It's too large to take on trips so I'll have to shop for another, smaller one for visiting family. Great! It really helped my shoulders. Made a difference when sleeping. NO COVER COMES WITH THIS, AS ADVERTISED!!!!!! This item is STILL being advertised that it comes with a cover, even though customer service advised me that it was a mistake and it should have been taken off the site. Although they do sell a pillowcase for this product, they refuse to send one as a way to correct their mistake and, obvious, false advertising. This is classic bait and switch, and is ILLEGAL. It was a week ago that they said it should be taken off the description of this item, but it hasn't. They are hoping to fool you too. Order at your own risk. I am FAR from finished with getting this order corrected or turned over to BBB and Attorney General for Bait and Switch. I had neck fusion surgery 4 years ago. I need a special pillow to sleep on at night to keep my neck aligned. I am a side sleeper and have tried the traditional pillows which do not give me the support I need. The "L" shaped pillow seems to support the neck and shoulders better. Just the right shape and comfort for my sleep position! What do customers think of this pillow? BEST ANSWER: I love it. 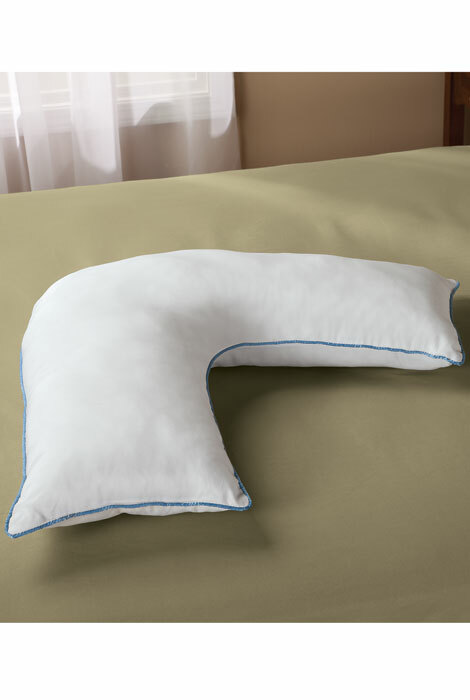 As a head pillow it allows me to comfortably sleep on my side & still provides some support to the back of my neck. It's equally good when I use it between my knees. I carry it with me when I travel so that I always have it. What do customers think of this pillow for comfort? BEST ANSWER: I guess that depends on what you want out of it... it's great for keeping your hips aligned while you sleep. what is the inside of this pillow made of ? can you buy pillow covers for this pillow?????????????????? BEST ANSWER: Thank you for your question. We do sell a cover for the L-Shaped pillow number 353956. We hope this information will be of help to you. I AM PRETTY SURE I BOUGHT MINE AT "CUDDLEDOWN "AND ALSO THE COVER. HOPE BTHIS HELPS YOU.